Valentine's day is just around the corner and that means our candy warehouse is filling up with all kinds of heart shaped candies. Brach's Jube Jel Hearts are a very popular Valentine' candy. It's hard to resist the yummy cherry flavor and the jube texture. Not only are these a favorite of adults , but these seem to be one of the old time Valentine candies that kids like as well. Many ask us what is a jube candy. The best way to describe it is a jube candy is a softer chewy candy. They are not quite as chewy as a gummy candy, they are a little bit more firm. Once you sink your teeth into one of these chewy hearts you get a burst of sweet tasting cherry flavor. One it comes to cherry flavored candies these are one of the best. Not only do they taste good but they only have 100 calories per serving , which is about 4 hearts. They have 0 fat, saturated fats, sodium and only 113 grams of sugar. These are the perfect Valentine candy to eat right out of the bag. They are also great to put on top of cupcakes add a few sprinkles and you have a pretty Valentine treat. 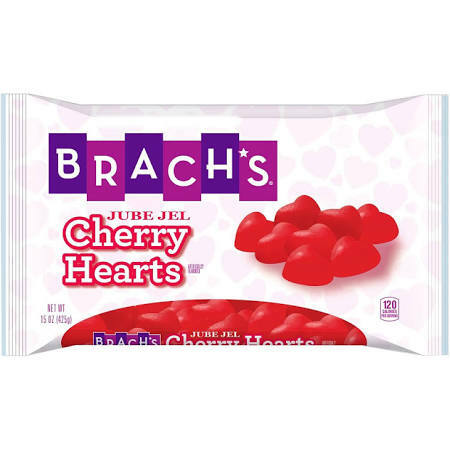 Buy your Brach's jube jel hearts early as they sell out pretty quickly.